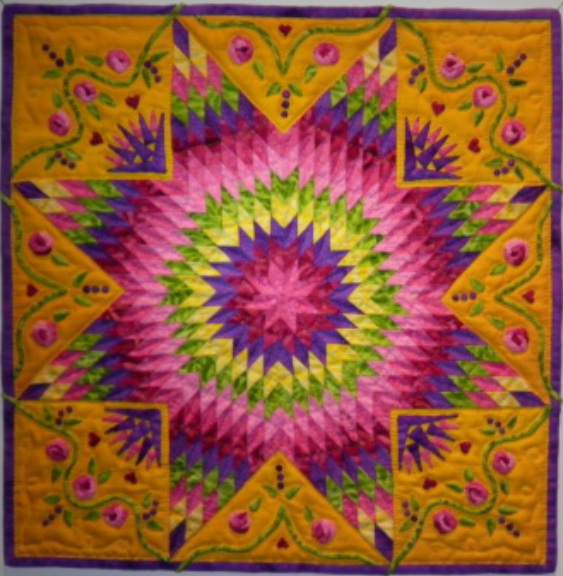 This miniature quilt was created for the Queenstown Symposium miniature section. One judge said they liked the way the vine 'molested' the bias edge? The desire behind this was to create something joyful and exuberant, (musical) using both piecing and hand appliqué methods. When quilts are designed with a emotion or passion behind them, it shows. Tiny mariner compass star sections are in each corner, and roses, hearts and the little purple dot flowers frame the little lone star pattern. The quilt is just over 13 inches square.